It’s official. Team Trump has confirmed its purchase of Doonbeg. Are Irish eyes a-smilin’? Well some of them certainly are. The prospect of this highly regarded resort lying fallow wasn’t one that anyone wanted to see. When the property went into receivership, there was obviously concern — especially amongst the locals, some of whom rely on Doonbeg’s deep-pocketed guests to butter their daily bread. The receivers are no doubt happy, too. This deal got done fast, and while there were a few other interested parties, in the end The Donald did what he does best. He outspent them. Trump reportedly paid 15 million euros for Doonbeg — a property that has hemorrhaged cash ever since it opened. For that sum, he got a golf course, hotel and a few luxurious lodges — some of which have fractional owners attached to them. Was it a good price? Well, it was evidently more than anyone else wanted to pay for it. But Mr. Trump has never been accused of thinking small. When Kiawah Development Partners created Doonbeg, they had a grandiose vision that has for the most part been realized. Great accommodations that cater to an international market. The potential for real estate sales. A good golf course — well, at least 14 holes of it are good. But they misjudged a bunch of things. Like how isolated Doonbeg is. And how stiff the competition is for links golf travelers in western Ireland. But their critical error was in guaranteeing their real estate buyers income from rentals — something that proved impossible and sunk the business. In its 11 years in existence, Doonbeg has never made a profit, and in 2011 showed a loss of over 6 million euros. Enter The Donald. Sources say that coming out of receivership, the real estate guarantees are gone. So that’s a load off. And chances are he’ll only improve on the quality of service offered at Doonbeg, which was already very good. But the golf course would greatly benefit from some redesign work — IF he’s allowed to do it. Some of the land adjacent to the course — land which would immediately improve the course if Trump were allowed to use it — is environmentally protected. That didn’t slow him down at Trump International in Scotland, but it didn’t earn him many friends, either. Can Trump do as he pleases at this site? Only time will tell. 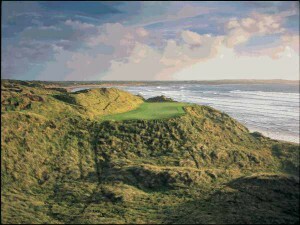 If not, Doonbeg may continue to struggle to attract the numbers of golfers it needs to pay its bills. There are just too many other strong choices in the area. If the Doonbeg course isn’t improved and in fact made great, those golfers may continue to skip it. I spoke with a U.S. tour operator at the PGA Show about Doonbeg and he said his clients use it and like it. For them, it’s a good stopover point between Lahinch and Ballybunion. Even the sometimes unreliable ferry over the Shannon Estuary doesn’t deter them. But will the rest of the world adopt the same attitude? We’ll see. It also remains to be seen what kind of reception Trump, and his son, Donald Jr., will receive from the Irish. Will they be welcomed with open arms as saviors who’ve come to restore a tarnished jewel in the Irish golf crown? Or will The Donald run roughshod over anyone and everyone who gets in his way as he did in Aberdeen? I’m hoping that he’s learned something from that experience and that he will handle his ownership of Doonbeg with a bit less bluster and a bit more humility. It’s a great property — and in some ways an important one. Let’s all just hope that this next chapter in its story doesn’t become a gruesome one.